Boca Grove Golf and Country Club is widely known as one of the most affluent neighborhoods in all of South Florida. Located in the heart of Boca Raton, this prestigious, members-only club is situated on 300 acres of verdant foliage and sparkling lakes, providing members with both the elegance and sophistication that they desire. In addition to the beautiful surroundings, Boca Grove provides a diverse selection of homes for sale and a host of world-class amenities. Boca Grove Golf and Country Club offers a wide variety of unique homes for sale, including beautiful townhouses, exquisite estate homes, and charming villas with a total of 443 residences spread throughout seven distinct neighborhoods. Chateau is a six-story luxury condo building with a full concierge service. Coventry offers 31 single-family homes, each, of course, complete with gorgeous golf course views. The Estates features thirteen single-family estate homes, most of which overlook the fifteenth hole of the beautiful golf course. Gardens in the Grove is comprised of two residential buildings, both with underground parking. Islands in the Grove consists of 56 single-family homes, each with private backyards complete with panoramic lake views. Los Rayos consists of a blend of ten single-family homes and 24 luxurious townhouses. Neighborhood Estate Homes boasts 250 amazing single-family estate homes. The Wine Room: offers an intimate setting for special occasions and meetings. Windows: a formal dining area with perfectly prepared cuisine designed to impress even the most refined guest. Turne: the perfect option for a quick gourmet snack following a round of golf. The Grille: a contemporary dining venue offering creative meals in a laid-back, casual atmosphere. The extravagant clubhouse at Boca Grove also boasts a luxurious lobby and lounge, as well as an on-site fully-equipped fitness complex, complete with a full team of certified trainers and an extensive offering of group fitness classes, such as pilates, yoga, and cardio salsa. Just outside of the clubhouse lies the Olympic-size swimming pool and the wonderful children's playground, where your kids can spend hours outside having a blast. Also, Boca Grove now proudly presents its new 18-hole championship golf course designed by golf architect Jim Fazio. This golf course has almost no wait for tee times and features tournaments year-round for golfers of all levels. Also, the highly professional staff offers group clinics and private lessons, open to all. If you want to sharpen your golf skills on your own, there is also a well-manicured putting green and an amazing driving range. Boca Grove Golf and Country Club is the perfect choice for tennis enthusiasts, as it is known as one of the premier tennis facilities in Boca Raton. There are twelve Har-Tru courts, six of which are lighted for night play, a top-notch pro shop, and world-class USPTA professional staff. The tennis program offers team play, youth leagues, tournaments, clinics, group and private lessons, as well as seasonal tennis events for members to enjoy. Offering some of the finest amenities available, Boca Grove Golf and Country Club provides its members with the ultimate country club lifestyle. 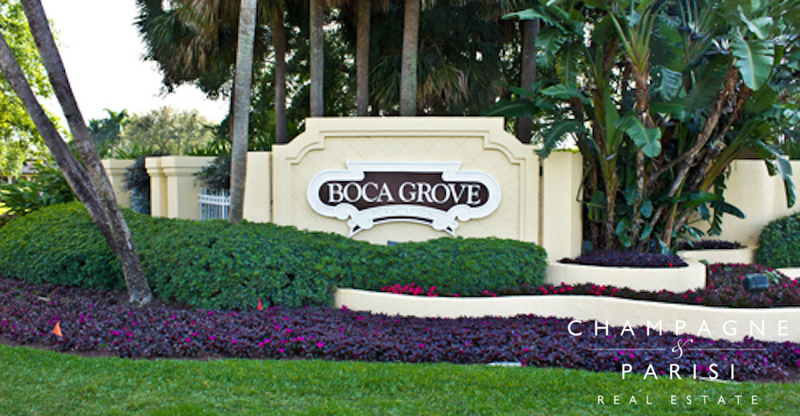 With the finest amenities, luxurious homes, and breathtaking surroundings, Boca Grove truly offers country club living at its finest. If Boca Grove sounds like the perfect place to live out your dream lifestyle, you may also want to explore homes for sale in Boca Woods, Boca West, and Broken Sound, all of which offer premier country club living in Boca Raton. If you would like to learn more about Boca Grove or any of the other residential developments in Boca Raton, please contact us at 561-998-9015. You may also reach us by completing the online contact form below, and one of our experienced agents will reach out to assist you. We at Champagne & Parisi Real Estate pride ourselves on our industry expertise and exceptional customer service, and would be delighted to assist you in finding your next dream home in always sunny Boca Raton, FL! Also, please consider registering for a free account which will enable you to receive automatic email notifications when new properties come on the market in Boca Raton, FL. Click the following link for a full list of Boca Raton residential communities.